Interface processing Staus – We have designed tool to fetch the list of files/messages that is currently processed in SAP PO for the given date and time range. Our tool further fetches corresponding list of IDOCs with IDOC status for these files from S4 HANA. Interface Schedule: We have more than 150 interfaces and all the interfaces are scheduled to generate files at different time of the day. 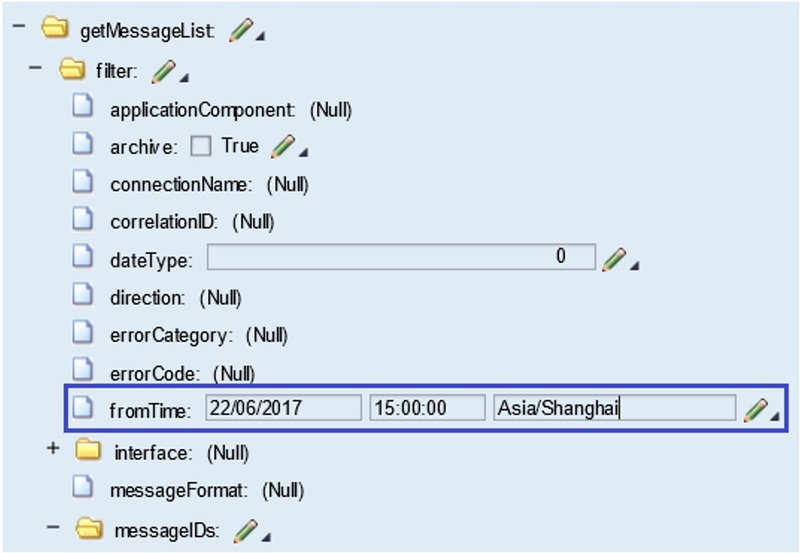 Business wanted to know which interfaces are scheduled to run at what time in SAP PO as per the Availability Time Planning (ATP). In this blog, we will go through technical design and also SAP PO detail design.Please note we will cover SAP Fiori Design and technical design in later blogs. 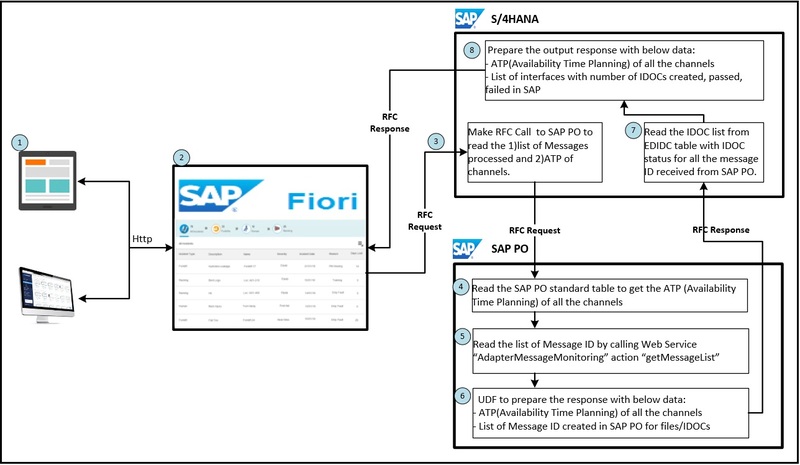 Below is high level design diagram for our solution where we have used RFC as protocol to communicate between SAP Fiori and SAP PO/S4H. Please note we can build this solution using rest based web service and direct call to PO also but due to client’s design strategy we have to design solution using RFC. Below is technical design for this tool, We will explain step by step design in this blog. Please note, in this blog we will only discuss about “Interface processing Staus ” functionality and “Interface Schedule” functionality will be discussed in next blog. In response, user gets the details about the Interface IDOC processing Status as shown in the below screen shot. We get IDOC counts as per the status for each interface of the project. Please note, in above screen we are not only showing Files/messages processed for specific interface but also we are showing IDOC status for same interface as well. IDOC status is grouped based on status, so in above screen we can see 3 files have been processed for interface I609 and total 6593 IDOCs got posted in SAP S4H with separate detail of successful and erroneous IDOCs. We also have detailed screen where we display how many documents are posted for this interface for one message/file.User is able to get end to end view of interface starting from SAP PO to SAP S4H via detailed screen. Please note that the details about this screen will be discussed in subsequent blog. Below is the technical details about the “Interface processing Status” functionality. Step 1. User request on Fiori application is sent to S4 via RFC call with the user input “From date and Time” and “To date and Time”. – Internally SAP S4 makes a RFC call to SAP PO to fetch the list of message id and channels ATP. Step 2. SAP PO Reads the standard table to get the Availability Time Planning of channels. Note: Technical details for ATP have been explained in separate blog Part-3. Step 3. Read the message id for all the files processed in SAP PO for given date and time. Step 3.1 Consume below web service to read message details from PO. Step 3.2 Enter from date and time as shown in the below screen shot to read all the message from SAP PO web service. – ATP (Availability Time Planning) of all the channels. – List of Message ID created in SAP PO for files/IDOCs. Step 5. SAP S4 receives the response from SAP PO and reads the IDOC list from EDIDC table with IDOC status for all the messages received from SAP PO. Step 5.1 Read table EDIDC filtering on the basis of message ID in field ARCKEY for the message ID where the Status is success in SAP PO. Note: Prefix message ID with asterisk ‘*’ and remove all the hyphen ‘-‘from the message ID. You will get all the IDOCs created with this message ID. Step 5.2 Read and count the number of IDOCs for each status depending on the value of field “IDOC status”. – List of interfaces with number of IDOCs created, passed, failed in SAP. I would like thanks to Binod Mondal for his help in building this solution.